Hi! Lori here from ScrappinMyStressAway and I am super excited to Design today! This week at Sweet Sassy Diva, the challenge is to use a Diamond in your project. I made a gift bag for a very special little girl. I have a new little baby girl who will be coming to my daycare in a couple of months. Tanner and I are holding Baby Grayson ~ isn't she beautiful! Her big sister loves Elephants and has a special lovey that is a pink elephant. Mom picked out a Giraffe for Grayson so I decided to make a Giraffe gift bag to hold her gift from me. I picked the Giraffe from Create A Critter and the coordinating Kite (aka diamond). I put the layers of the giraffe on my mat sized at 3.24 inches. Instead of using the top layer with the round spots on it, I copied a second middle layer and added hearts as my spots. I did not weld, instead I grouped the hearts (George and Basic Shapes, variety of sizes) with the giraffe body so they hearts would cut out. I added some grass from Paper Doll Dress Up sized to 1.73 inches. I added a sun from Create A Critter and some clouds from April Showers. I used yellow, pink, green and blue cardstock to cut out the pieces. I used some ink, pop dots and stickles to add some dimension. Here is my gift bag ready to stuff full of goodies!! Thanks for having me over today Bobbi Jo!! This week at Frosted Designs, our challenge is rolled paper. I have wanted to make these tiny flowers for a while now and decided to give them a whirl this week! I took 4 different flowers from Art Philosophy and sized them to 1 inch. I put them into groups of 5 each in each 1/4 of my mat. I loaded four colors of cardstock: yellow, pink, red and purple. I cut out the flowers but had a little trouble with the reds. Luckily I cut out way more than I needed for this project! Originally I planned on putting the flowers all around the square cut out, but later changed my mind. I found this card on Wild Card and sized it to 5.5 inches. I flipped the card when I realized I wanted to draw the word "love" inside the card, showing through the opening. I used this "love" from Home Decor sized to 0.61 inches. First, I drew in "love" using my Chomas Gel Pen Holder and a black pen. Then I returned to the design, changed layers to the card and put my blade back in. I cut out the card. I folded it over so the love shows through. I used my paper quilling tool to roll up the flowers. I glued them with Scotch liquid glue. I decided to create a window flower box look. First, I cut out another card in this yellow patterned cardstock, inked and adhered it to the front of the card. Then I cut out the frame layer of the card in brown. I trimmed the sides and top by 1/8" and inked it in brown. I adhered the branches along the bottom and then used the liquid glue to adhere the flowers on. I finished with a bit of twine along the spine (I am a poet)! Here is my LOVE-ly window card! 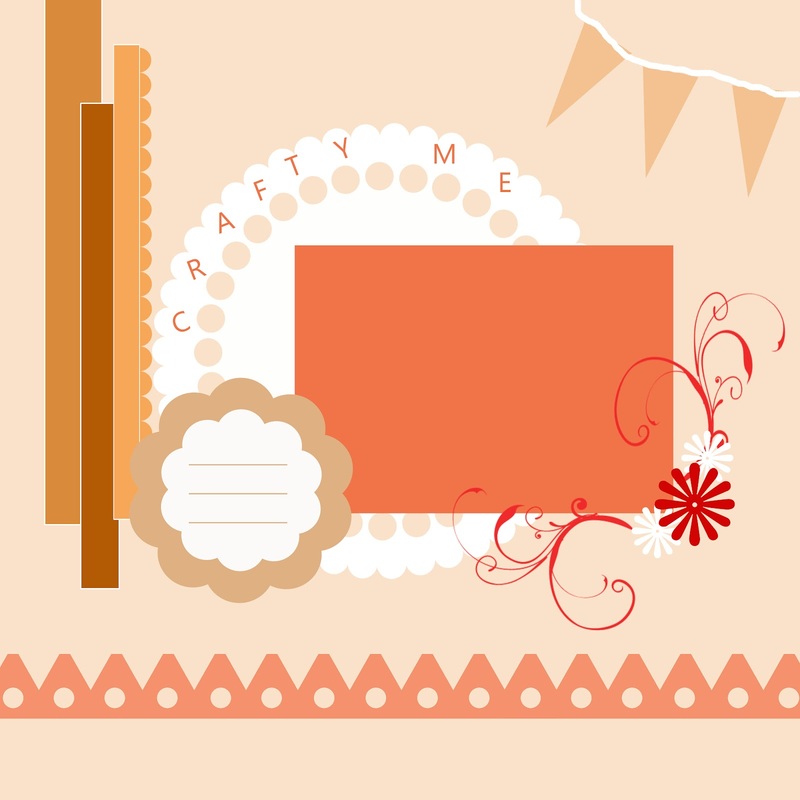 I hope you join us at Frosted Designs with a rolled paper project of your own! 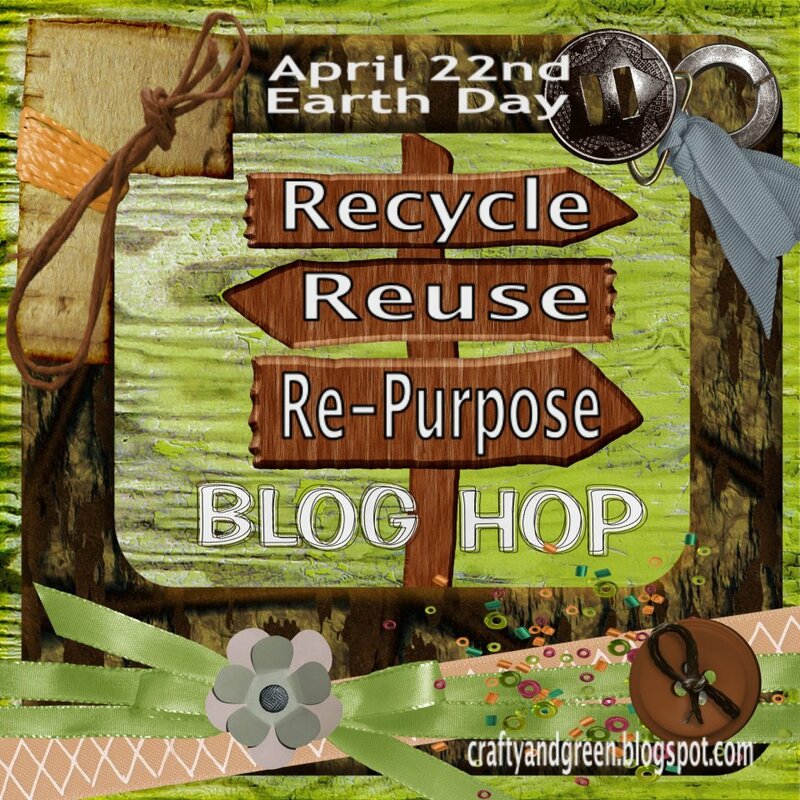 Welcome to the Recycle, Reuse & Re-Purpose Blog Hop in Honor of Earth Day! Every year, The United States and over 100 different countries join together in the celebration of Earth Day on April 22nd. Earth Day is the largest, most celebrated environmental event worldwide. On Earth Day, we remember to appreciate nature and learn ways to protect our environment. Find ways that you can help keep the planet clean and help protect our environment! Today our Hop is Hosted by Tina from Crafty and Green. She Loves to Craft Green!! 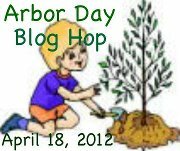 What a Great Way to Share our Love of the Earth by having a Fun Blog Hop! You should have hippity hopped along from AMY, but if you just stopped by my blog to visit today, I don't want you to miss a single thing!! Please start at the beginning which is HERE. What's a Hop without some fun Candy to go Along with it? Two 4 oz bars of soap, 7 oz body Souffle, and 16 oz of Bathsalts. 2.) You must become a follower of Crafty and Green if you aren't already! I went to the thrift store and rescued this nasty looking cookie sheet. I also rescued a lamp shade that I used in my second project. I spent $2! I grabbed some spray primer that I had left over from another project and primed both sides of the cookies sheet. Next, I spray painted the cookie sheet black to match my scrap nook. Using my Gypsy and purple vinyl, I cut out "Imagine" from Wall Decor and More sized at 2.29 inches. I cut out the swirl from Home Accent sized at 6.70 inches. I use settings 3-3-3 on my Expression (or Vinyl on my E2) and then weed out the extra pieces. I use clear contact paper as my transfer tape. I de-stick my clear contact paper on my jeans. I forgot this step once and really regretted it! I took some denim from some of my old jeans after I lost weight and glued a strip onto a cardstock circle making a flower. I put a purple gem in the center and glued it to the cookie sheet. I mounted my magnet board to my cupboard door (that hides my circuit board) above my desk. I removed the lamp shade from the frame and used the bottom ring as a frame for my wreath. I cut strips of denim and tied them onto the ring along with white tulle. I tied a tulle bow and clipped on three gerber daisies from Michaels. I hung this on my basement door near my craft nook. I used the top of the lamp shade for another Recycled project ~ a clip it. You can see the project and how I made it HERE. Thank you so much for joining me today to celebrate Earth Day. Now, Please Hippity Hop on over to the talented ANN-MARIE to see what she has created for your viewing Pleasure! "I have a saying that trees are one of our utilities, and the reason I say that is because they help clean the air, they help control rainwater runoff, they convert carbon dioxide into oxygen," he said. "What we really have when we have a line of trees around the city is a utility that provides good things for the population without having any cost associated with it." Today, we are celebrating the wonderment of trees and we welcome you in our celebration. If you are just visiting me, I would love for you to have a good "roots" with our hop and start at the beginning of our seedling which is HERE. If you have arrived from Tiffany then don't "bark" up the wrong tree as you are standing in our midst! I did not have any photos that would work with a "tree" theme right, so I created a card instead. This apple tree with a swing is my very favorite tree! This image alone is the reason I purchased Just Because Cards! I opened up a 12x12 mat in my Gypsy and put all of the tree layers on the mat sized to 6.44 inches (which will fit a card base that is 6.44 inches). I put the card base on my mat and sized it to 5.5 inches. I wanted my card to be horizontal (not vertical) and I wanted my tree a little bigger than was suggested by the cricut cartridge. This is one of the features I really like about my Gypsy ~ I can see my project and how the pieces will go together BEFORE I cut them out!! Here are all of my pieces cut out. I layer the tree pieces together and put a little twine on my swing. I used Denim twine from The Twinery. I took some striped paper from my scraps and used it as the background of my card. I tied some red crinkle ribbon around my card mat to showcase the red in the apples. I stamped "Thinking of You" from Pink By Design as my sentiment on the front of the card. I left the inside blank. Thank you for visiting us today as we celebrate the lovlieness of our trees. Your next stop along our trail is ANITA. Thank you for counting our rings and not stumping along the way! You can shop the store now by going to GingerSnapScraps! Lori here and I have to say that I "met" Cori on Facebook and ordered from her already. The service was great, my products came quick and she has already expanded her inventory since she first opened. Cori asked several of us tons of questions before she opened her store ~ especially what we wanted to see in her inventory!! 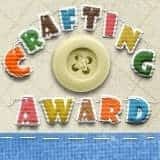 If you need or order crafting supplies, go check her site out!!! My Inspiration LO ~ BugBytes Blog Hop! 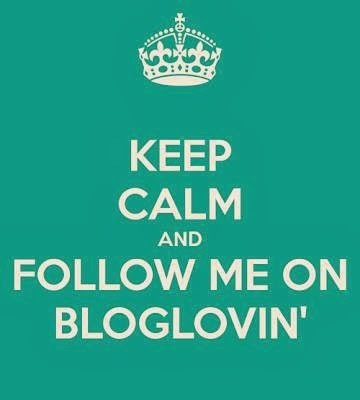 Welcome to the Bug Bytes Blog Hop!! We were asked to create a project around the sketch below. When I think of my "Crafty Me" I always start with photographs when creating a layout. So, instead of a photo of me crafting, I thought I would share a photo of what inspires me most ~ my family! I also loved this orange paper and since I was wearing orange in the picture it just made sense to combine the two!! Here is the sketch our wonderful Pam created! I liked it so much that I used it for a layout of my nieces too! And now on to my layout!! Look at all of that patterned paper! This is the most patterned paper I have ever used in one layout!! I put my piece of "negative" paper down to use as a template to line my letters up. Stuck them down and carefully peeled away the template. Perfect placement every time! I added some twine and hemp cording to the banners. I added some journaling to my layout. I used one of my edge punches to detail the side. This paper is the reverse side of the striped paper. I LOVE flip flops! I just had to include these because you can see Tanner's flip flops in the picture. I put a piece of hemp cord right above the flip flop paper with five knots tied in it ~ one for each of us. I used mini glue dots to keep it in place and taped the back of the paper. 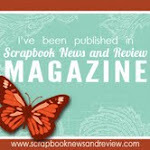 Thanks for stopping by and checking out my inspiration for scrapbooking!!! Your next stop in the hop is the fabulous Cricut Couple! 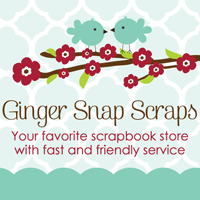 Ginger Snap Scraps ~ New Online Store! !